The latest forecast, given as a seemingly innocuous aside in a discussion about the future value of Tesla vehicles, nonetheless came as Musk’s lawyers are negotiating with SEC over an agreement that put controls on the billionaire’s tweeting. A U.S. judge gave the two sides until April 18 to meet for at least an hour and resolve their differences. If they can’t, she’ll rule whether Musk is in contempt. The legal tussle for Musk, 47, served as a distraction amid a record decline in deliveries for Tesla during the first quarter. Concerns about demand for Tesla’s vehicles escalated last week after the Nikkei reported the company and partner Panasonic Corp. were freezing plans to expand capacity at the battery factory they share in Nevada. Musk on April 13 disputed reports that Panasonic had boosted annualized battery cell production capacity at the plant to 35 gigawatt hours, saying the company’s lines were only at 24 gigawatt hours and have been constraining output of Tesla’s Model 3 sedan. The stock is down 21% this year. Both the Panasonic and the next-12-months production tweets are noteworthy in light of the settlement that sprang from Musk tweeting in August of last year about trying to take Tesla private. SEC accused the CEO of securities fraud, and Musk settled. He agreed to pay $20 million, step down as chairman and seek pre-approval from an in-house securities lawyer before tweeting information material to the electric-car maker. SEC spokeswoman Judy Burns, and a Tesla spokesman declined to comment on Musk’s latest tweet about the carmaker’s production. 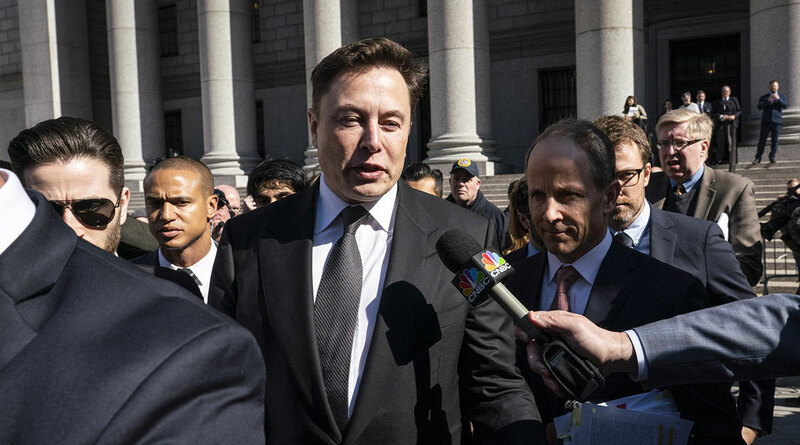 In an April 4 hearing at which Musk appeared, U.S. District Judge Alison Nathan questioned the specifics of the CEO’s settlement with SEC and told the two sides to rework the language of their agreement. “Take a deep breath, put your reasonableness pants on and work this out,” Nathan said. She wrote in an order the next day that if Musk is held in contempt, the court will allow further briefings on sanctions. SEC said at the hearing that the remedies it was seeking included a series of escalating fines for future violations, and monthly reporting on Musk’s communications.